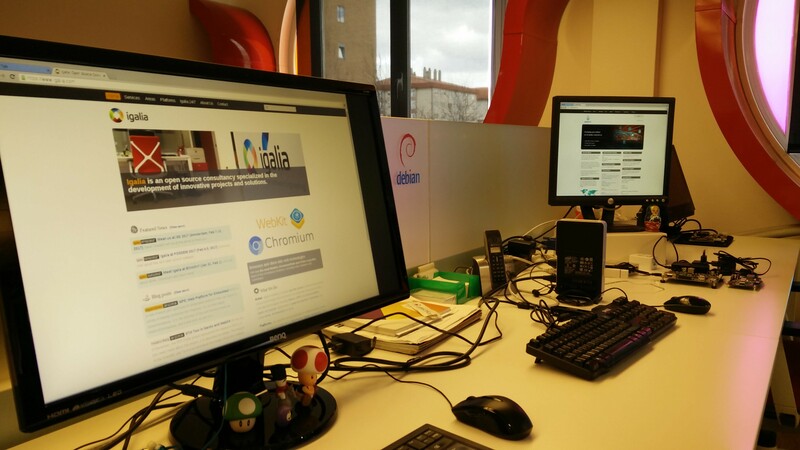 I’ve devoted some of my time at Igalia to get a newer version of Chromium running on the GENIVI Development Platform (GDP). Since the last update, there have been news regarding Wayland support in Chromium. My colleagues Antonio, Maksim and Frédéric have worked on a new Wayland backend following modern Chromium architecture. You can find more information in their own blogs and talks. I’m linking the most recent talk, from FOSDEM 2018. 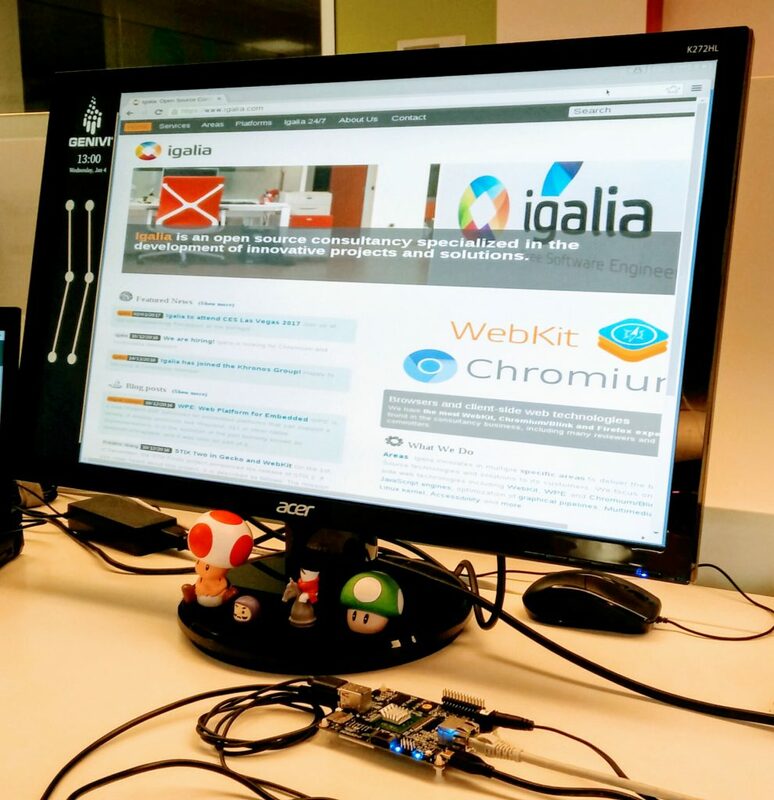 Everyone can already try the new, Igalia-developed backend on their embedded devices using the meta-browser layer. I built it along with the GDP but discovered that it cannot run as it is, due to the lack of ivi-shell hooks in the new Chromium backend. This is going to be fixed in the mid-term, so I decided not to spend a lot of time researching this and chose a different solution for the current GDP release. The LG SVL team recently announced the release of an updated Ozone Wayland backend for Chromium, based on the legacy implementation provided by Intel, as a part of the webOS OSE project. This is an update on the backend we were already running on the GDP, so it looked like a good idea to reuse their work. I added the meta-lgsvl-browser layer to the GDP, which provides recipes for several Chromium flavors: chromium-lge is the one that builds upon the legacy Wayland backend and currently provides Chromium version 64. The chromium-lge browser worked out-of-the-box on Raspberry Pi, but I faced some trouble with the other supported platforms. In the case of ARM64 platforms, we were finding a “relocation overflow” problem. This is something that my colleagues had already detected when trying the new Wayland backend on the R-Car gen. 3 platform, and it can be fixed by enabling compiler optimization flags for binary size. In the case of Intel platforms, compilation failed due to a build-system assertion. It looks like Clang’s Control Flow Integrity feature is enabled by default on x64 Linux builds, but we aren’t using the Clang compiler. The solution consists just in disabling this feature, like the upstream meta-browser project was already doing. The ongoing work is shared in this pull request. I hope to be able to make it for the next GDP release! In the previous blog posts, we described the work to bring the Chromium browser to the GENIVI Development Platform (GDP) using the latest version of the Ozone-Wayland project. We also introduced our intention to develop multi-seat capabilities on that version of the Chromium browser. This post covers the details of the multi-seat implementation. The GENIVI stack is supposed to allow applications run in multi-seat mode. A seat is a set of input/output devices like, for example, a touchscreen and a keyboard; one computer (the head unit) connected to several seats should be able to assing applications to each seat and let them run independently. Hence, our goal is to let one Chromium instance manage several browser windows at the same time and independently, getting their input from different seats. I’m currently in Birmingham, ready to attend the 16th GENIVI All-members meeting! Integration of the Chromium Browser in the GENIVI Platform, where I will present the status of the integration of the Chromium browser in the GDP and the plan for the next months. Slides available here. Update on the Open Source Browser Space, where I will provide the latest news on the ever-changing world of Open Source browsers, and in particular regarding browsers supporting Wayland natively. Slides available here. In the previous blog post, we introduced the work to port Chromium to the GENIVI Development Platform (GDP). We have continued working to improve the integration, and make everything easier to build. In first place, we are now using the latest code from the Ozone-Wayland project that builds on top of Chromium 53 instead of Chromium 48. We have rebased the meta-browser recipes for the newer version and contributed the patch to the upstream project, together with other patches to clean the build process and to fix issues on certain platforms. Some issues detected in the earlier steps of the integration were addressed. The aspect ratio of the browser window has been modified to fit the GDP demonstration HMI. A performance degradation when playing video had also been detected, the problem was not actually in Chromium, Pulseaudio was taking all the CPU away from the browser processes when using the default null sink. We fixed it by setting Alsa as the default sink with the command pacmd "set-default-sink AlsaPrimary" (do it in /etc/pulse/default.pa to make the change persistent). We are obviously bypassing the GENIVI Audio Manager here, it should be integrated at a later point. We are in the process to merge our patches into the GENIVI platform, to make the Chromium browser part of the default build. You currently have to use our fork of meta-genivi-dev, while the meta-browser layer has already been added as a submodule and it’s not necessary to explicitly add it. 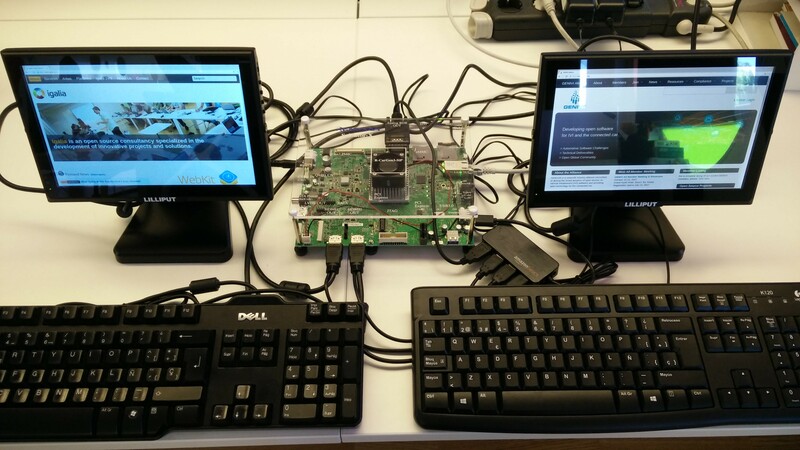 Finally, we have been testing how Chromium and Ozone-Wayland behave in multi-seat environments using the Wayland IVI Extension and the IVI Layer Manager libraries to have full control of screens, layers, surfaces and focus. We have extracted some conclusions that will allow us to make Chromium behave as expected in this scenario. Setting up GDP master for your board. Make sure you are using the latest master to get the meta-browser layer automatically. While review is ongoing, you may add our fork as a new remote for the meta-genivi-dev submodule and switch to the chromium-integration branch. Finally, just bitbake your image, the Chromium browser has been made part of the default image in one of the meta-genivi-dev patches. 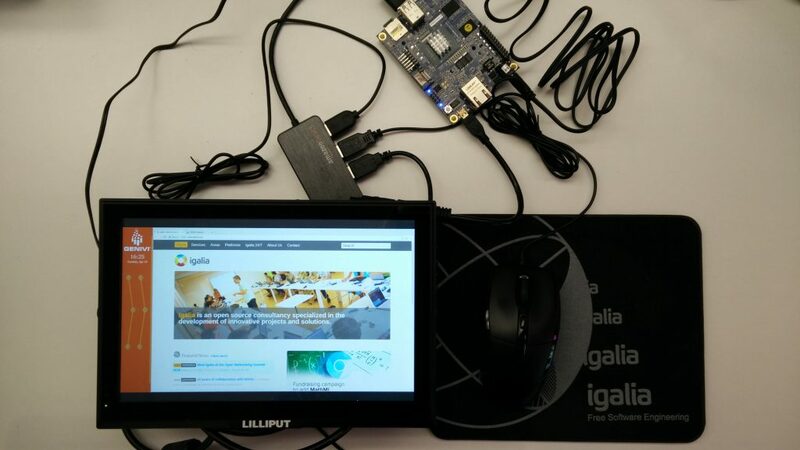 A warning about platforms: please notice we are currently using a Minnowboard as a test platform. There is a known issue on Raspberry Pi that we hope will be fixed soon. Regarding R-Car Gen. 2 boards, we think it should work, we have ran Chromium there before but not recently. This work is performed by Igalia and sponsored by GENIVI through the Challenge Grant Program. Thank you! In the last weeks, I’ve been working to integrate Chromium in the GENIVI Development Platform (GDP). GENIVI provides a platform tailored for the needs of the In-Vehicle Infotainment (IVI) industry. It’s interesting to highlight their early adoption of Wayland for the graphic stack and the development of the Wayland IVI extension to fulfil the specific needs of IVI window manager implementations. In GDP application model, apps are under control of systemd, which takes care of starting and stopping them. Through the ivi-application protocol, applications register their surfaces to be managed by HMI central controller. This HMI controller will be in charge of manipulating the surfaces belonging to applications for presentation to the user, using the ivi-controller protocol. In the end, the Wayland compositor will compose the surfaces on screen. The first step was to build Chromium for the target platform. GDP can be built with Yocto, and the meta-browser layer provides a set of recipes to build Chromium, among other browsers. Support for Chromium on Wayland is granted by the Ozone-Wayland project, developed mainly by Intel. We had already used this combination of software to run Chromium on embedded platforms, and made contributions to it. To achieve the integration with the GDP application model, we need to put some files in place so the browser can be controlled by systemd and the HMI controller has some knowledge about its existence. We extend the chromium-wayland recipe with a .bbappend file added to the GDP recipes. With everything in place, and one additional dependency from meta-openembedded, we are able to add Chromium to a GDP image and build. Get the GENIVI development platform and follow instructions to set GDP master up for your board. Get the meta-browser layer and add it to your conf/bblayers.conf. I currently recommend to use the branch ease-chromium-wayland-build from this fork, as it contains some cleanup patches that haven’t been integrated yet. EDIT: patches have been merged into upstream meta-browser, no need to use the fork now! You should already have the meta-openembedded submodule, so add meta-openembedded/meta-gnome to your conf/bblayers.conf. Get the integration patch and add it into the meta-genivi-dev submodule. You may add this fork as a new remote and change to the chromium-integration branch, or you could just wget the patch and apply it locally. EDIT: the patch has been amended several times, links were updated. Add chromium-wayland to your IMAGE_INSTALL_append in conf/local.conf. Now you may bitbake your image. Next steps include integrating my patches into mainline development of their respective projects, rebasing meta-browser to use the latest possible version of Chromium, trying more platforms (currently working on a Minnowboard) and general fine-tuning by fixing issues like the weird proportions of the browser window when running on GDP.